AVAILABLE NOW! 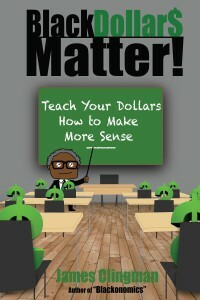 in hard copy and Kindle eBooks on Amazon.com, the latest offering from the nation’s most prolific writer on economic empowerment for Black people, Clingman’s 5th book on the subject aptly describes the dominant-submissive relationship between economics and politics, respectively. It contains stark and sometimes biting commentary, statistical data, and documentary information, with thought provoking quotations sprinkled throughout. In the 1970’s Saturday Night Live did a spoof on razor commercials, after the double-bladed razor came out. The commercial went something like this: “You have felt how easy your double bladed razor glides over your face and gives you a close shave. Well, now we have an even better razor that will do an even better job. It’s our “Triple Play Razor.” The first blade pulls the hair up from your face; the second blade holds it there; and the third blade cuts it off for the closest shave you have ever had. Why do we tell you this? Because you will believe anything.” I guess SNL was right, because now we have expensive and even better five-bladed razors. Black folks are told some of the most ridiculous things, which reminded me of that SNL spot. When it comes to police killing and abusing Black people, we have heard it all, that is, until we heard that Freddie Gray broke his own cervical vertebrae, severed his own spinal cord, and crushed his own larynx by banging himself against the walls of an otherwise empty police van. To convince us even more they said he even had a wound on his head that “matched” a protruding bolt in back of the van. Of course there was no camera in the prison section of the van, and the van driver had no idea what was going on; he never thought to look through the grate between the front and the prison compartment to see Freddie Gray killing himself. Why did they tell the people that? Because we will believe anything. After all, Black people are superhuman, you know. There are many cases of their superhuman strength recorded in the annals of police folklore. Rodney King was one of the “Gorillas in the Mist” they had to subdue by a continuous beating by five or six cops. Rodney was so strong and imposing, you know. Victor White III, 22, and Chavis Carter, 21, were superhuman too. Both of them were arrested, handcuffed behind their backs, searched, and put into the backseat of police cars, in Louisiana and Arkansas, respectively. Both ended up pulling out guns from wherever they had concealed them from the cops, despite the searches performed by the officers, and shot themselves in the head. Of course, they died. By the way, no one was charged with those killings, because the perpetrators were already dead; they killed themselves, just like Freddie Gray did. Why did they tell us this? Because we will believe anything.